Mary, my friend from high school, and I like to read a book together once a year or so. She recently sent a list published on September 15 by PBS News Hour titled, “13 Fall Books That Will Make You Think.” We picked this novel from that list. It was right below What Happened by Hilary Rodham Clinton. Imagine our surprise to open our library copies and discover this book was written in 1949! 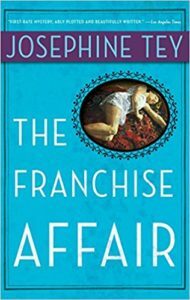 The Franchise Affair is a British crime novel, which apparently breaks the rules of British crime novels (no, I don’t know what the rules are!) Josephine Tey (real name, Elizabeth MacKintosh) wrote 24 novels and plays, some under her pseudonym, Gordon Daviot. In this novel Betty Kane, 15, accuses two older women, mother and daughter, who live together in an old mansion called The Franchise, of kidnapping her, keeping her for a month, and beating her. A local attorney in their small British town is hired to protect and vindicate Marion Sharpe and her mother. Mary: While dated in writing style and very British in tone, some of the themes are very current, in particular the media's influence on society. Based loosely on a well-known case that took place in England in the 1800's, I liked the story and how the author developed it. Tey fleshed out the characters well, even some of the minor ones like Aunt Lin. While I did find the writing style dated, I appreciated Tey's method of illustration or "turn of a phrase". I believe there is a literary term for it but darned if I remember it from high school English classes. Here are a few examples from later in the book when I thought to make note of them. When Robert encountered Betty's mother in the courtroom, he realized that despite his warm feelings toward her "....the game had been laid out on the squares now and they were chequers of different colour." " 'She can never again take a step on to green grass without wondering if it is a bog.' " Marion reflecting on Betty's adoptive mother. Andrea: Like Mary, I really enjoyed the “turn of the phrase.” I found the writing style intelligent and interesting. I thought the story had depth. It barely resembles much of our modern-day crime fiction, which can be so formulaic. I found this novella an easy and entertaining read, and I wanted to know how the alleged crime resolved itself. I would like to read more of Josephine Tey, except, there are so many books on my list, I may not get to another of hers for a long time. You may want to try her on for size! Cool. I will be posting again this weekend, so let’s see what happens.